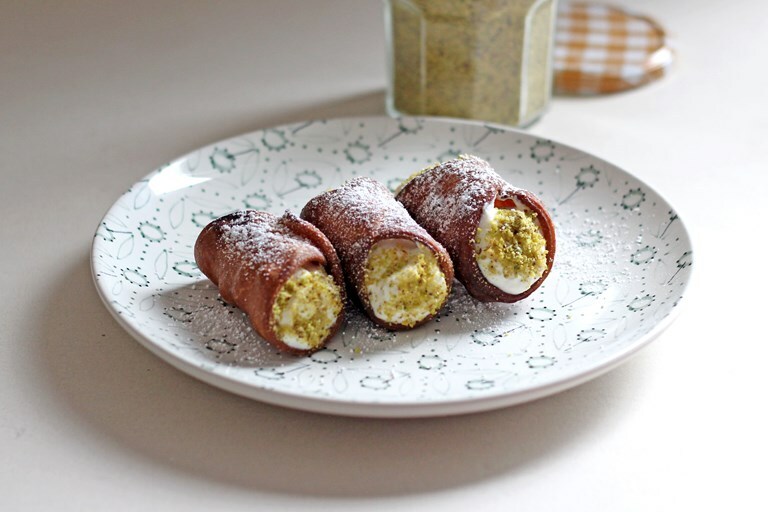 Antonella la Macchia shares her favourite recipe for cannoli, a delicious Sicilian snack made with fried pastry, ricotta and a range of different toppings. Antonella recommends filling the pastry just before serving to stop the cannoli from going soggy. Along with cassata, cannoli are the most famous Sicilian sweet treat. The name 'cannolo' was taken from the river reeds used to shape the shells in the past. In Sicily, a feast or simple Sunday lunch always ends with a tray of cannoli in the middle of the table. The classic cannoli filling is ricotta and candied fruits, but today you can find cannoli filled with chocolate, orange, pistachios, cream and a range of other ingredients. This is my favourite cannoli recipe; the shells are crunchy, the ricotta cream is simple and not too sweet and the cannoli’s size is small – the perfect treat for the end of the meal or for a festive coffee break.